sheep and no city: You spin me right round, baby - and left! You spin me right round, baby - and left! I can't get this silly song out of my head when thinking about the RPM socks. And talking about head, the fact that this song also evokes memories in the direction of hair fashion in this glorious time makes knitting and thinking and talking about these socks quite a challenge. But they are finished now (actually since before Christmas!) and they feel good! I might have looked just like this on several occasions during the knitting process. 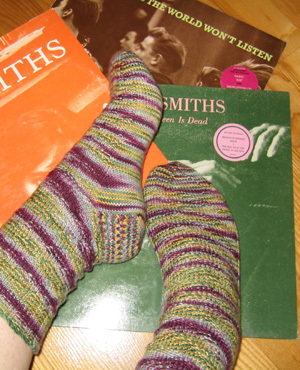 ...................Toe: the one from Embossed Leaves by Mona Schmidt (IK winter 05). ...................the spiral into the toe and besides it is very comfortable with my feet. I have to admit that it was a very challenging process to knit these socks. I completely overlooked the tag tangy at knitty's - what the heck, knit and purl...? But, I frequently messed up the counting when moving the purl snake over the round's join. However, the pattern is a winner. I always liked the little purl bumps of variegated yarns and this spiral is also a nice twist to striped yarn. Great design. by Carola at 6:30 e.h. Eye of Partridge is my favorite sort of heel. Nice socks! I liked that toe on EL but I think I left out the purl bumps on the bottom side... can't quite recall. I'll have to look in my sock drawer in the morning to find out. mars 09, 2007 11:30 e.h. Very cute socks. I do like those. You have to update your wip sidebar as those rpms are done! Pretty color too. mars 09, 2007 11:59 e.h.
these looks great carola!! i am currently knitting my own rpm socks and i have to concur it is a great easy pattern...that you can mess up really easily! glad to see you are back and posting! mars 10, 2007 1:00 f.h. 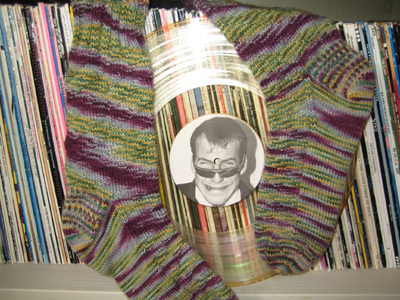 I agree - knit and purl looks great in varigated yarns. mars 10, 2007 4:02 f.h. I'm knitting this pattern right now and I keep accidentally doing a K3 instead of K6. Your socks look great, and they're inspiring me to press on. I might copy you and do an eye of partidge heel. mars 10, 2007 6:01 f.h. Wow! What a cool pattern! mars 10, 2007 10:58 f.h. mars 10, 2007 3:29 e.h.
Great socks! I love Eye of Partridge heels. They look so crisp. mars 11, 2007 2:19 f.h. they look great! i do love that colorway and it works so well with the pattern! mars 12, 2007 3:03 e.h.
BTW....your Wee Tiny Sock is on it's way to you!! I can't wait to see how long it takes your pkg. to arrive in Iceland...all the way from the Southern United States! While filling out the customs form I was told 4-7 days for you to receive! mars 16, 2007 8:17 e.h.